Interminably increasing petroleum rates and exhaustion of fossil reserves have ignited a global search for substitutes to renewable fuel sources. 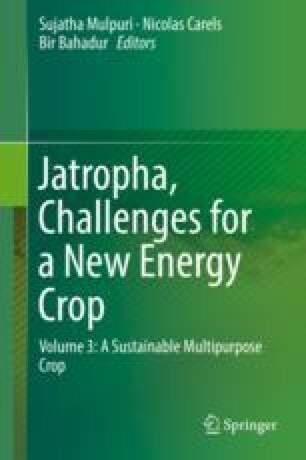 Many oil-generating plants, crops and trees have been considered for biofuel; among these Jatropha curcas is regarded as one of the most promising oilseed plants as its seeds contain oil content up to 35%. Because fossil oil consumption is increasing day-by-day, there is an urgent need to enhance the oil content. Transgenic technology is one of the advanced techniques that have been applied to enhance oil content and modify the composition of fatty acids in seed oils. Increasing seed oil content can be done by modifying the enzyme’s level expression in the triacylglycerol biosynthetic pathway. In this chapter, an effort is made to highlight the potential of transgenic technology towards the enhancement of the oil content and in altering the candidate gene expression for biosynthesis of triacylglycerol. The manuscript number is PRIS (PRIS- CSIR-CSMCRI - 190/2018).